Game Plan #4: Priority Inbox, Identify Priority Targets! In this 4th installment on Gmail we're going to look at the wonderment that is the Priority Inbox! Important and unread emails: Just like it sounds, unread emails that are marked as important are in this top priority tier. They may also be Starred or not. Starred: This contains emails that are Starred, but aren't marked important. Both read and unread emails that are starred will be in this second tier. Empty: This is an additional tier you can configure as you wish, but is left empty by default. Everything else: Read or unread emails that don't fit any of the above requirements. As we discussed in the first in this series, Understand the playing field if you want to dominate, archived emails by definition do not show up in the inbox, Priority or otherwise. The Priority Inbox gives you a great way to prioritize your inbox so the most important content rises to the top for immediate attention. To see how to set this up and the options you have, watch the video! In this third in a series on using Gmail, we're going to talk about Filters. This builds directly on Game Plan #2: Labels. Labels are great for organizing your emails, but you sure don't want to have to label each and every email as you read them! No worries, with filters you can automate this process such that as emails come in, they get the appropriate label applied for you. Taking the field with Gmail #2: Hit Labels Hard! Game Plan #2: Hit Labels Hard! In this second in a series on using Gmail, we're going to talk about Labels. Labels are Google's answer to Folders in other email programs. They are more flexible and efficient to use than Folders. You can apply one or more Labels to an email in seconds to effectively organize your emails. They then are easy to see by clicking on a Label in Gmail and to also visually identify in a long list of emails! I show how to create and apply Labels in this video. I also spend some time showing how to turn off Category tabs. I am not a fan and think they are completely unnecessary vs. using Labels. I reference this article in the video on what I view as the horror of trying to use Categories and Labels together! Use one or the other, but not both... wait, no, dump Categories and embrace the power of the Label, Luke! Sorry this video is a bit longer than I'd like, but I wanted to cover a fair bit of ground so if it takes 15 minutes, that's what it takes. It could be 15 minutes that will save you hours and leave you with more hair this year! In the next installment on Gmail, I'll cover Filters, now that we have Labels out of the way. Filters work with Labels powerfully so you can automatically apply Labels to emails as they come in. After that... the awesomeness of Priority Inbox! Get your mobile email noise under control! This is a pro-tip for Gmail Android app users and serves as an addendum to last week's tips on managing email distractions contained in the post, "All multitasking is not the same". Hopefully, your email app supports this feature, if not time to switch <grin>. I counsel clients to not allow themselves to be a slave to their email, but to check it at scheduled intervals throughout their day. This means setting mobile email to not chime on your phone for every new email coming in. However, there are times when you are waiting on a particularly time-sensitive email and don't want to miss it. This is a nice compromise setting as I hate having every honkin' email that comes in chime on my phone. It is distracting not only in work, but hideously discourteous to co-workers, family and friends. This "next email will chime" setting means that if you are actually awaiting a critical email you can check on each chime, clear the notification and know the next email will also chime until you get that urgently needed email since you'll be checking after every "new 1st email" chime. Nice thing is that the rest of the time your phone will chime once and then sit there quietly till your project is "check email". Makes for quieter meetings, solid family time and not being that annoying idiot in social settings. Unfortunately, the Gmail app on iOS doesn't have this particular feature. Instead it does allow setting Notifications for All, None or Important. Important is a decent compromise presuming you have your Gmail set to use Priority Inbox, but not quite as distraction reducing as Notify Once on Android. Go to Settings in Gmail app on Android. Select account with which you want to use Notify Once. Select Inbox / Priority inbox sound & vibrate. 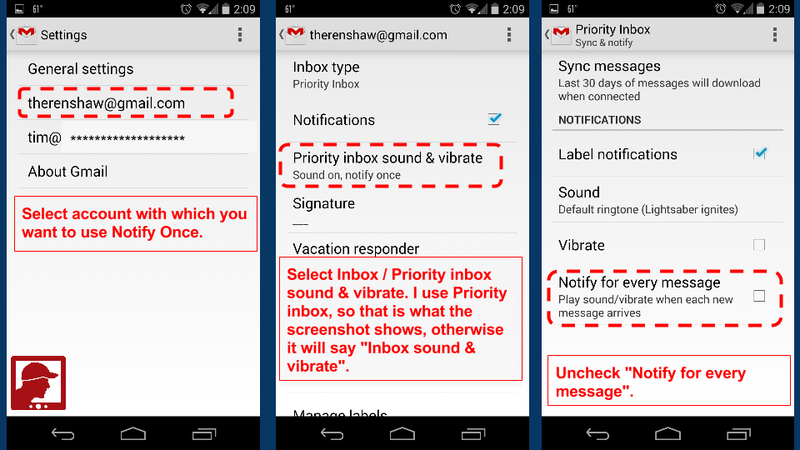 I use Priority inbox, so that is what the screenshot shows, otherwise it will say "Inbox sound & vibrate". Uncheck "Notify for every message". Done! Now your notification will only make a sound / vibrate on the next message that comes in after you check messages. A friend shared an article with me today titled "The High Cost of Multitasking", which on the face of it flies in the face of my posts last week containing the recurring theme of maximizing your PC screen real estate to help with "multitasking". So given this article, which is just one of a recurring theme of articles and even books on the evils of our increasingly multitasking technological society, was I leading you astray in pursuit of more efficiently multitasking? That is a natural and legitimate question. The prefix extra means outside or in addition to. Distraction multitasking is a nicer phrase to capture the idea of performing tasks across separate, disparate projects. This is "bad" multitasking to be avoided! A project can be anything digital or physical, the concept holds true whether you are jumping back and forth between a financial report and a customer presentation or between building a cabinet and yard work or any combination of these simple examples. You end up distracted jumping back and forth and it takes time to change focus and get "in the zone" to accomplish the task at hand efficiently, hence timely and with high quality. The prefix intra means within. Focused multitasking has a nicer ring to it and at least for me, removes any confusion between intra and inter. The idea of focused multitasking is doing multiple tasks in pursuit of completing a single project. This isn't really "good" either, but is an unavoidable requirement of complicated projects in the virtual or real world. Cabinet makers don't glue pieces together and wait for them to dry before grabbing other pieces and get to work sanding them. Parallel processing is better than serial when possible, yes? Consider the financial report and customer presentation example used above. What if you need the financial report data for use in your customer presentation? Perhaps you need to work with the finance department to get this done as you don't have or perhaps understand all the data that goes into the report. You need to communicate with the finance department and are waiting on answers. Do you stop working on your presentation till all the communications are complete? Probably not and definitely not if the presentation has any kind of time urgency. You work on the presentation with a close eye or ear on your email or phone to make sure the communications get done as quickly as possible while you work on the bits of the presentation you have immediate control over. In this situation having good control over your technology tools is important so that you work efficiently taking into account the fact you aren't in possession of all the info you need. There are more and less effective ways to embrace the "distraction" of getting the information you need as quickly as possible. If the two projects are completely unrelated it would be inefficient to allow every email and phone call that comes in take you away from working on your presentation. Getting in and staying "in the zone" and focused is what you're after. Jumping back and forth between an unrelated financial report and a presentation is just counter-productive. I'm not arguing that the situation of having to keep an eye out for communications from the finance department is a good or beneficial thing, it isn't. Having to keep an eye or ear out for more information is a distraction. However, in service of getting a single project done, it is necessary.and more efficient than losing a day playing phone-tag with finance. I can see from the wince on your face that you've been there! Enough of the theory and simple example. I'd like to share with you some technology practices I use when working to control Extra and Intra-project multitasking. Only have the applications you need to use on that project visible to you on your PC. If you only need one, that should be the only one you see. If you need a couple apps, there are lots of ways to move between them. Learn the options for your OS and master them using the keyboard instead of the mouse as much as possible. Sometimes alt-tabbing between a few that are set at full screen is the ticket. Sometimes being able to see one while typing in the other or dragging and dropping between them is optimal. That's right, minimize or even close email! Do not let your email pop-up on-screen notifications or chime... ever. Seriously, this should be one setting you go do right now. I don't mind that it distracts you from this article. Close all IM programs, close all social programs or browser tabs that chime or flash when new messages come in. Mute your phone... completely. All those little beeps, whistles and chirps create mental pressure to find out what's going on whether you realize it or not. Close your door and post a "do not disturb" sign if you have to. Headphones are great for this if you're stuck in a cubicle as a visual clue to co-workers whether you actually listen to music or not. Same as for controlling extra-project multitasking. Same as for controlling extra-project multitasking. I prefer to be able to see some portion of all my apps on-screen in use for the project as my projects are rarely single document focused. I make big use of notes and checklists so being able to see and use those readily is advantageous to my work style. If you're waiting on an email that's critical to the completion of the project here's a couple approaches I use to keep an eye on it such that it distracts me as much as possible. My preferred practice: I put a window showing my inbox so I can just see enough of it behind and to the left of my primary project app window so I can see the From field so when that finance guy answers I see it immediately and ignore everyone else. Mute your phone, but set your phone so you can see new email notifications as they come in. Not optimal as keeping your peripheral vision engaged on a second screen is definitely not optimal and every notification will distract you unnecessarily. You could turn on pop-up screen notifications, but this usually takes more steps to turn on / off than my preferred practice under #3, directly above. Close all IM or similar programs except those you need if the input you're awaiting may come in on it... or if you are going to use it to "ping" i.e. annoy the person who's holding you up. They'll wish they'd followed these practices! If you're expecting input via phone call, then make use of the smart part of your smart-phone and set-up unique caller ringtones! Set a unique ringtone for those people you frequently collaborate with such that you know when the finance guy calls vs. everyone else! This keeps your visual focus on the task at hand and you can set your phone out of eyesight, but not miss the call you are anticipating. Same as for extra-project multitasking... close the door and / post a "do not disturb" sign. Headphones are great for this if you're stuck in a cubicle as a visual clue to co-workers whether you actually listen to music or not. What do you think of these practices? Do you agree there are different types of multitasking that vary in their level of evil? What do you do to minimize or manage extra and intra-project multitasking distractions?